On a recent Monday, volunteers gathered in the Roll Up N Dye studio in Columbia to craft elaborate tags with glitter, hearts and various messages that read "You are not forgotten," "This is for you" and "I am not lost. If you need me, take me!" Mary England, a blogger and self-love and mental health advocate, then attached the colorful tags to piles of scarves that were donated from all over the country as a part of the Baltimore Scarf Abandonment Project. In its second year, the project has accepted around 700 donated scarves, both homemade and store-bought, from locals and people around the country since the fall, and will assemble on Jan. 13 for the final installation, in which a group will tie scarves of all colors and fabric to a fence at the Jones Falls Expressway underpass on Guilford Avenue and East Madison Street for people in need. The 29-year-old Locust Point resident, who runs the blog Uncustomary launched the project last year after learning about a church in Portland, Oregon, that tied donated scarves to a fence. Someone suggested that England repurpose the event in Baltimore, a city which as of January 2017 had an estimate of 2,669 homeless people, according to a report provided by the Mayor's Office of Human Services. "I was like, 'I'll totally do it,'" said England while sitting in a coffee shop in Locust Point, her fiery red hair adorned with a crown of flowers. It was a project that fell into line with many of the art-abandonment and random-acts-of-kindness events that England has already hosted around the city in hopes of spreading love and cheer. The inaugural Scarf Abandonment project was a success, she said, generating hundreds of likes and shares on social media. She received around 300 scarves, a combination of donations and handmade scarves from the country, and welcomed hats, gloves and other cold-weather accessories. On the day of the installation, seven volunteers helped attach the scarves with heartwarming messages to a fence on the corner of North President Street and East Fayette Street, a park where many homeless people congregate and sleep at night. It's one moment, one act. England doesn't maintain follow-up contact with any of last year's recipients. But this year's event comes after a week of sub-freezing temperatures. And, as one homeless advocate sees it, the effort benefits both recipients and givers. Jessica Watson, owner of Point North Design Studios in Federal Hill and a volunteer during last year's event, said hanging the scarves took around just 20 minutes. Watson, 34, and England said they were almost immediately swarmed by people asking "What do you have?" which made it difficult to get a picture to document the moment. But Watson said seeing people read the positive messages and "smile as they (were) walking away, it feels really good." It challenged the misconception that making a difference requires a lot of money or connections. "I think what Mary has done with this event is show it doesn't matter who you are, you can still have a positive impact in the community and do something that can mean the world to someone else," Watson said. This year, England expects an even larger turnout. More than 800 people RSVP'd for the event and more than 5,000 have noted that they were interested on the Scarf Abandonment Project's Facebook event page as Wednesday. England says she's received scarves from nearly every state and from countries including Canada, the United Kingdom and Germany. In addition to her P.O. 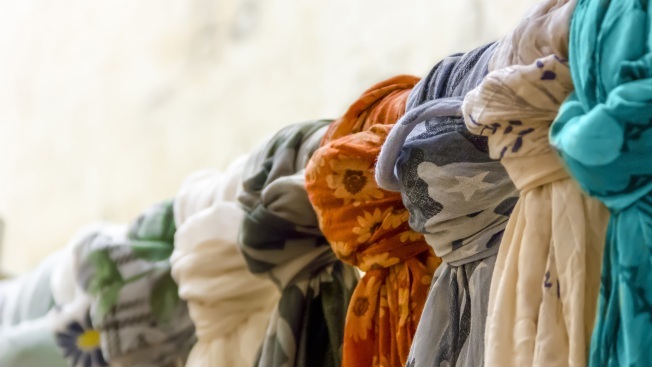 box, volunteers from at least five places within the city, including Watson's studio, offered to be drop-off locations for scarves for several weeks. England has also hosted multiple drop-off locations throughout the city. In early December, England was sure that she had already exceeded last year's amount, quantifying the amount of scarves as "many, many, many boxes," and with the drop-off locations and the additional scarves brought by individuals to the day of the event, she estimated that there will be around 1,000 total. "My post office hates me right now," said England, adding that she has been picking up boxes of scarves weekly. "This year has gotten crazy," said England. The workload, however, has been minimal. While she answers questions about the event online often (despite a lengthy FAQ post on the Facebook page), England said the project's followers and interested participants are doing a lot of the work by sharing the information and offering to help. "I've reached out to no one... Every single business, every single media, every single everything has reached out to me. I have not done any kind of release or paid advertising, any kind of anything. I made a Facebook event, shared it on my business page and my website, and the reason it's been shared is because people are every day sharing on their own profiles, and I see it every single day," England said. "I'm really grateful that people are not only wanting to participate and showing up and doing the thing, but also saying, 'Hey guys, let's do this together.' Word of mouth is huge, man." Bonwyn Preis, 63, who helped create tags for the Scarf Abandonment Project in December, also heard about the event on Facebook, and thought, "What a nice way to get involved." Driving from her home in Hanover to her job in downtown Baltimore, "I see the individuals that are homeless and are asking for money, and I know there is a need out there,'' Preis said, adding that she enjoyed using colorful foam hearts and snowflakes to create the tags. England also provided a list of messages, like "You are cared about," "You are beautiful,'' and "This was made especially for you'' for the tags, that got Preis thinking how soup kitchens and shelters often attend to the physical needs of those who are in need or marginalized, "but how often do they maybe fill their spiritual or emotional needs?" "I hoped maybe, maybe they'd do a little bit of that for them," Preis said of the messages, that it "touches them in some way other than just that the scarves and hats and mittens will provide them with some need for protection against the cold . but that it touches their heart and makes them realize that somebody cares." While getting off the streets is the most beneficial outcome for those who are homeless, Jeff Singer, a longtime homeless advocate and adjunct instructor at the University of Maryland, Baltimore, School of Social Work, said that the event has some benefits. "It certainly does fulfill some emotional needs both for the person receiving the scarf, but probably even more powerfully for the person leaving the scarf. We all want to feel useful and that we're helping our neighbors. We're so isolated in this society . and homelessness in part is a symptom of this isolation,'' Singer said. "My only concern is that we can't substitute a scarf and kind words for the kinds of changes in public policy that we need to end homelessness,'' said Singer, but a project like England's could spark the will and determination needed to abolish homelessness, he said. With the sizable turnout this year, England said events like this - random acts of kindness - need to happen between strangers more regularly. "It doesn't happen enough. We don't have to be overwhelmingly giving each other gifts at the line at Starbucks, but we don't need to be rude or unkind either. There's just a lot of lessons to be learned from seeing the reactions that you get from doing something like this," she said, encouraging people to come to the installation. "As much as I know it's going to be overwhelming to have a lot of people there, I want people to feel that. I want people to feel the energy and get that vibe of what's going on and know what it's like to be immersed in that goodness." The Baltimore Scarf Abandonment Project will install scarves at Guilford Avenue and East Madison Street from 2 p.m. to 4 p.m. Jan. 13. For more information, visit uncustomary.org/scarf.